While the ability to mechanically fly was denied to people until the beginning of the 20th century, toys that could fly have been in existence for hundreds of years. A wood cut from 1587 shows boys playing with a multi-bladed flying toy of slightly different desigh but which used the same principles. We advise users unfamiliar with flying the toy to place the shaft on the heel of the left hand and hold it in place with the fingertips of the right. The right hand is then slid quickly forward up to and past the fingertips of the left hand and beyond. 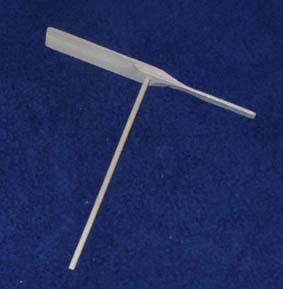 As the right hand moves forward and past the left hand's fingertips, the propeller will sail into the air. Always be sure, too, to keep the thumbs down so that they don't hit the spinning propeller blade. Because this toy can fly up to 30 feet into the air, we recommend you use it only out in open fields away from trees and buildings.